The violin shoulder rest is an accessory that allows for more comfortable playing and violin positioning by adding height to the shoulder and preventing the instrument from slipping. It may be made of wood, metal, or plastic. Usually, the violin shoulder rest attaches to the edge of the back of the violin with "feet" padded with rubber tubing or made of soft plastic. 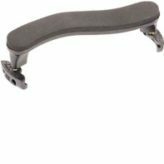 A shoulder rest generally follows the curve of the shoulder; some shoulder rests are bendable, others are made of sponge-like material, and a few have an extension that hooks further over the shoulder for stability. Click on the individual violin shoulder rest products for more details and larger pictures.